The first climbing-specific study on nutrition might change the way you climb. When Emily, my college-aged daughter, asked me to go to the climbing gym, I thought it would be an easy outing with some quality bonding. After all, I bike and run, and did not consider my daughter a strong athlete. After falling off the easiest route for the fourth time, however, I lay on the ground, rubbing my sore forearms and feeling humbled. My daughter gave me words of encouragement: “Dad, you lasted 10 minutes longer than Mom.” Meanwhile, Emily effortlessly climbed the most difficult route. Although clearly not a climber, I am a sports-science researcher who has worked with athletes in almost every sport, written three books on sports nutrition, and even developed the first recovery drink. My climbing experience got me thinking about the impact of nutrition on climbing performance. To my surprise there was no research in this area even though participation in the sport is exploding. I called Dr. John Seifert, a well-known sports-science researcher, and suggested some studies. Dr. Seifert’s lab at Montana State University is unique because it has a rock-climbing treadmill. This led to the first nutrition study done with climbers, the results of which were presented at the 2011 annual meeting of the American College of Sports Medicine. 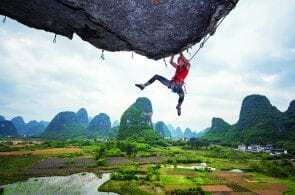 The study subjects, seven males and one female, were experienced climbers who on average had been climbing for nine years. Total vertical climb in each interval was 1,500 feet and both the speed of the Treadwall and pitch changed (from 10 to 40 degrees overhanging) during the climb. Muscle damage was measured by a blood test. 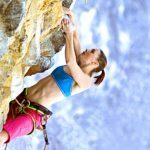 The results, presented in this article, are an interesting testament to how nutrition can enhance climbing performance. Physiologically, climbing is unique. In most activities an increase in exercise intensity is paralleled by an increase in oxygen consumption. However, at least with high-level climbers, oxygen consumption does not necessarily increase with the difficulty of the climb. Additionally, overall energy expenditure is far less than in cycling or running because it is confined to a selective group of muscles primarily due to sustained and intermittent forearm contraction. 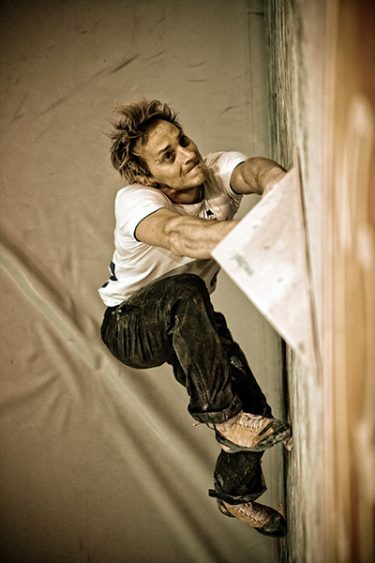 Anaerobic metabolism plays a key role in energy production to drive muscle contraction for climbing. Muscles have two energy systems: an aerobic one, which generates energy in the presence of oxygen, and an anaerobic one, which generates energy in the absence of oxygen. Sustained forearm contraction relies almost exclusively on the anaerobic system, which is only about five percent as efficient as the aerobic one. This reliance on the anaerobic system has important consequences: Muscles fatigue more quickly and nutrient stores are depleted more rapidly than in aerobic exercise. A third consequence of anaerobic metabolism is acid buildup in the muscles. During climbing, acid levels can increase almost threefold (compared to resting), and they remain elevated even after the climb. Acid buildup is highly correlated with muscle fatigue. 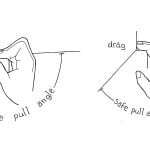 For example, hand-grip strength can decline by 57 percent from the beginning to the end of a climb. 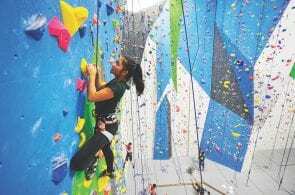 Muscle fatigue is not the only issue for climbers. Brain fatigue, also known as central fatigue, is a major factor in performance decline. Fatigue signals emanating from the brain can directly impact the force of muscle contraction. Additionally, brain-fatigue signals can produce a loss of concentration. Although nutrition can mitigate the depletion of muscle-energy stores and delay the onset of fatigue, climbing imposes practical limitations on fueling methods. Because weight and bulk are the enemies of climbing performance, the nutrition must be light and portable. The climbing environment also imposes additional limitations. Hot, humid or windy conditions can speed fluid loss and dehydration. In light of these physiological and practical obstacles, how does a climber select the best combination of nutrients to achieve optimum performance during a climb and rapid recovery afterward? Most climbers use the priming or pre-climb stage to fully hydrate their bodies. The beverage of choice is water and the standard recommendations suggest consuming one liter or more prior to starting the climb. However, fluid intake should be driven by three considerations: the number of climbs (or pitches) one expects to do in a specific time frame, temperature and humidity and the fact that, on average, our GI tract can only absorb about 36 ounces of fluid per hour. If you are fully hydrated before you start your climb(s), top off by drinking 16-20 ounces. Drinking too much before you start climbing will make you feel uncomfortable and if you exceed your body’s absorption capacity, will do you little good. There is no question that maintaining hydration is a critical goal. 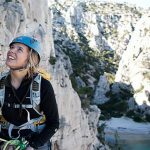 A fluid loss of two percent of overall body weight, which is not unrealistic when climbing in high temperatures, can significantly reduce muscle performance. However, hydration is just one part of the equation, and the pre-climb plan should always include nutritional supplementation beyond water. Here’s why. Muscles contain a limited amount of glycogen (the form in which the muscle stores energy). When glycogen is depleted, muscle performance drops dramatically. Even though climbing utilizes a selective group of muscles, the body cannot recruit glycogen from other muscle groups. In other words, there is no central glycogen pool. When you deplete glycogen in your forearms, it is not readily restored, and sustained use of the forearm muscles rapidly depletes the glycogen pool. Consuming food or beverages can delay glycogen depletion by raising blood-glucose levels. Muscles can utilize blood glucose as an energy source. The net result is that limited muscle-glycogen stores are preserved and muscle endurance is extended. Glucose is derived from dietary carbohydrate. Therefore fluid and carbohydrate are the cornerstones of pre-climb nutrition. The goal is to raise the blood-glucose level before you start climbing. But there’s a role for protein, too. Protein has been shown not only to improve re-hydration, but also to help minimize fatigue signals emanating from the brain. 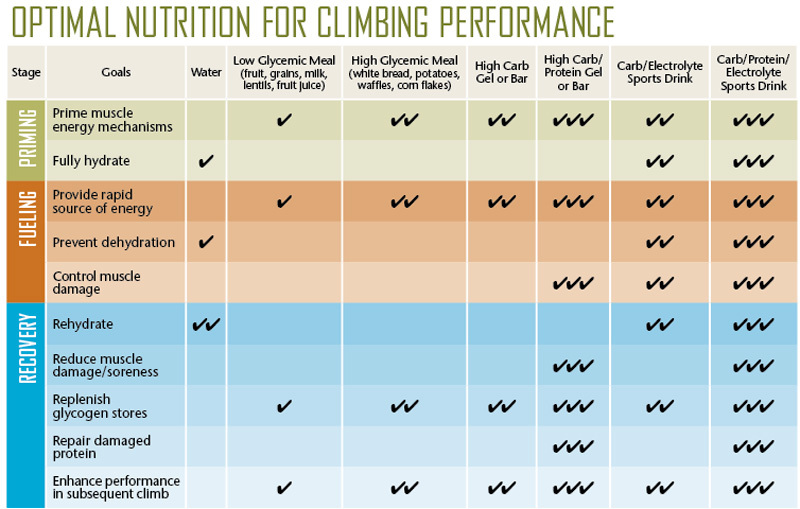 You can use various combinations of fluid and solid food to optimize your pre-climb nutrition (See Table 1), but there are a number of advantages to consuming a sports drink that contains protein because it can meet your total pre-climb needs, is easy to consume, and absorbs rapidly. As a general guideline, consume 100 to 120 calories of a carbohydrate/protein sports drink in the priming stage. The key goals of fueling during your climb (or periodically throughout the day if you’re climbing single pitches) are to provide a rapid source of energy, minimize dehydration and control muscle damage. All forms of exercise create muscle damage, which is an underrated cause of fatigue and loss of performance. 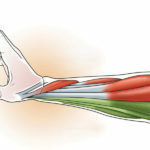 In climbing, muscle damage in the forearm muscles is of special concern. Research has shown that protein, when consumed with carbohydrate during exercise, reduces muscle damage and thereby delays fatigue. Again, as shown, lots of different nutrition options and combinations can meet your fueling goals. The researchers reported that the carb/protein gel, compared to the carb-only supplement, did indeed reduce muscle damage—by 56 percent. And compared to water, the carb/protein gel reduced muscle damage by 79 percent. 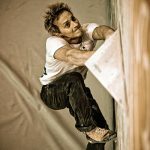 Seifert concluded, “These findings indicate that a carb/protein gel supplement offers significant advantages during rock climbing.” Depending on the intensity of your climb/pitches, consume 100 to 200 calories per hour. An online poll among climbers noted that beer was their preferred recovery drink. However, your body’s nutritional needs do not end when the climb is completed. Although I have nothing against beer, I would suggest that serious climbers delay their first beer until after they have consumed real recovery nutrition, as doing so will reduce their post-climb muscle soreness and help them climb better the next time. The post-exercise period represents a unique metabolic opportunity for athletes. Immediately after exercise, the metabolic machinery responsible for replenishing muscle-energy stores, rebuilding muscle protein and reducing muscle damage are in a heightened state of activation. Unfortunately, this metabolic window of opportunity is only open for about 45 minutes. Research performed by myself and others has shown that when the right combination of nutrients is consumed during this time, the result is greater and more complete restoration of muscle-energy stores and an increase in protein synthesis, which is critical for repairing and rebuilding damaged muscle tissue. This greater recovery translates into a much stronger performance the next time you exercise. As a general guideline, consume about 125 calories of a recovery beverage for every 30 minutes of climbing. Two caveats. First, if you delay consuming your recovery nutrition beyond the recovery window, you lose most if not all of the benefits of this heightened metabolic activity. Second, not all nutrients work equally well. Multiple studies have shown that the ideal recovery beverage contains carbohydrate and protein in a 4:1 ratio. In fact, compared to a carbohydrate-only beverage, a carb/protein beverage replaces muscle energy stores 128 percent better and rebuilds muscle protein 38 percent more effectively. The results compared to water are even more dramatic. The bottom line is that you need to consume appropriate recovery nutrition within 45 minutes of finishing each and every climb. The nutrition you consume before, during and after your climbs won’t magically transform you into a 5.14 climber. But consuming the right nutrients at the right times will enable you to climb stronger and longer, and bounce back faster. Separating Herbal Hype from Herbal Science? A number of herbal supplements promise to improve climbing performance, but there is often a disconnect between what the manufacturer claims and what the studies show. 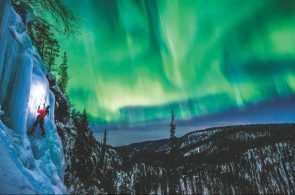 The challenge for climbers: How do you separate the hype from the science? For example, two popular herbs, cordyceps and rhodiola, claim to improve endurance, decrease lactic acid and increase delivery of oxygen to muscles. The published studies paint a very different picture. Five peer-reviewed studies came to the same conclusion—these herbs did not improve any parameter of endurance or reduce muscle fatigue. Although these results may be discouraging for climbers, a recently published study on another Chinese herb, ciwujia, may provide some hope for climbers looking for an herbal magic bullet. 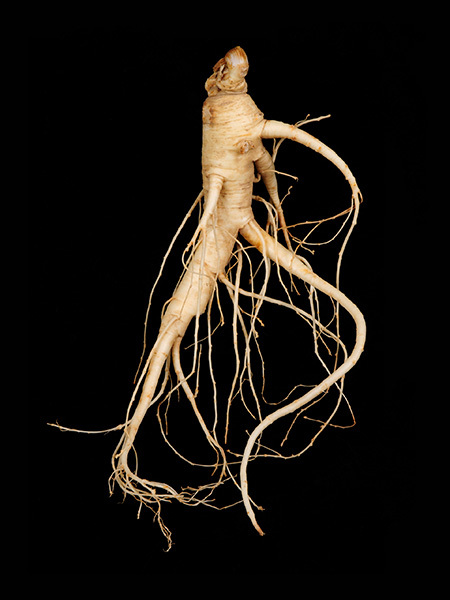 Ciwujia is a well-known type of ginseng that has been used in traditional Chinese medicine for over 1,700 years. Ciwujia first came to the attention of sports scientists in the mid-1990s based on anecdotal reports of its use by Tibetan mountain climbers to enhance work performance at high altitudes. Multiple studies conducted in the U.S. and in China showed that ciwujia improves exercise performance, reduces feelings of fatigue and lowers lactic-acid levels. The latest study published in the prestigious Chinese Journal of Physiology is particularly credible because the researchers used a double-blind, placebo-controlled crossover protocol, the gold standard for research. They found that eight weeks of ciwujia supplementation increased oxygen uptake by 12 percent and endurance performance by 23 percent. Two things should be kept in mind if you decide to use ciwujia. First, positive results were seen after eight weeks at a dose of 800 mg per day. Second, make sure that the ciwujia you use is a standardized extract. This is the only way you can be certain that the amount of ciwujia listed for each capsule is accurate. For years, carbohydrates dominated the conversation in terms of improving muscle performance. We now know, however, that the addition of protein to a carbohydrate supplement can produce large improvements in both performance and recovery. In the 1990s researchers at the University of Texas demonstrated that a combination of carbohydrate and protein in a 4:1 ratio improved both the speed and quality of muscle recovery. Carb/protein recovery drinks replenished muscle glycogen stores almost three times better than carb-only drinks, decreased muscle damage by 90 percent and improved endurance performance up to 55 percent in exercise bouts conducted 14 to 16 hours later. In fact, the carb/protein drink was 37 percent more effective than a 90-percent-pure protein-supplement drink in rebuilding muscle protein. The carb/protein combination has also been shown to be superior when consumed during exercise. Compared to water or a carb-only beverage, protein-enriched sports drinks dramatically increase rehydration, extend endurance and reduce post-exercise muscle damage. Based on these studies, protein should be considered an essential macronutrient before, during and after climbing. Many climbers drink coffee before starting routes because it makes them more alert. Although caffeine has been shown to improve aerobic performance, research now shows that it may be particularly beneficial to climbers. For example, caffeine consumption may inhibit brain-fatigue signals that have been shown to decrease the force of muscle contraction. 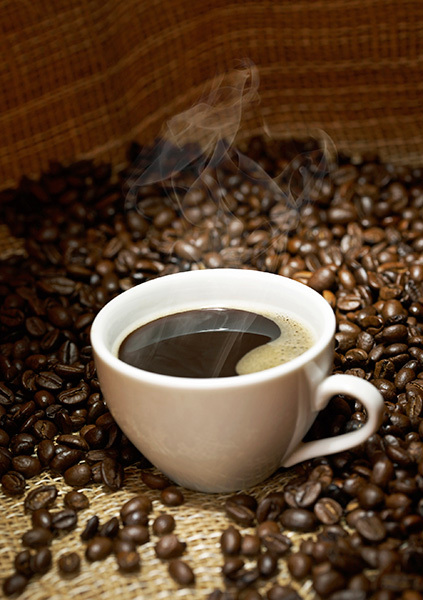 Caffeine also raises blood-sugar levels, providing a source of energy for working muscles. Consider adding caffeine to the fueling stage in the amount of 100 mg at the midpoint in a multipitch climb or halfway through your workout or outing. A number of carb and carb/protein gels contain caffeine. One of the more persistent myths in sports nutrition is the idea that long-acting carbohydrates delay fatigue better than products containing “fast-acting” sugars because they provide a more sustained level of blood glucose. In fact, just the opposite is true. Exercise performance declines very rapidly when muscle-glycogen stores are depleted. 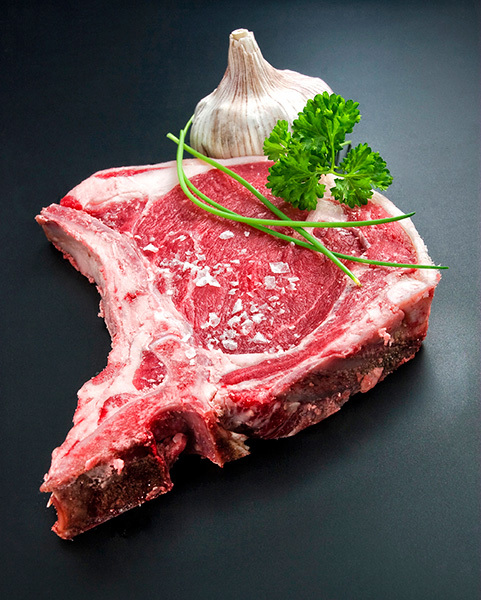 The goal, therefore, is to preserve muscle glycogen as long as possible. Fast-acting carbs are rapidly absorbed in the GI tract, transported to muscle cells, and metabolized to provide energy to working muscles. By providing an instant source of energy, fast-acting sugars preserve muscle glycogen, thereby extending endurance. This is critical for climbers. Long-acting complex carbs such as those found in whole grains, beans and foods that are very high in fructose, such as honey, are absorbed more slowly, and must be metabolically converted to fast-acting sugars before they can be transported to the muscles and used as energy. All this takes time, so the working muscles continue to deplete their limited supplies of muscle glycogen while they wait. The result is faster glycogen depletion and faster onset of muscle fatigue. Long-acting carbs certainly have an important place in the overall diet of climbers, but that place is not during and immediately after climbing. Dr. Robert Portman is coauthor of Nutrient Timing and Hardwired for Fitness. His articles have appeared in Men’s Fitness, Velo News, Triathlete and 3/GO. Portman works with PacificHealth Labs, a company that holds patents on the 4:1 ratio. Independent studies including some published in the Journal of Applied Physiology and Medicine and Science in Sports and Exercise have substantiated the efficacy of the ratio. Products with the 4:1 ratio can be purchased at GNC, Vitamin Shoppe or pacifichealthlabs.com. A turkey sandwich also has the 4:1 ratio.